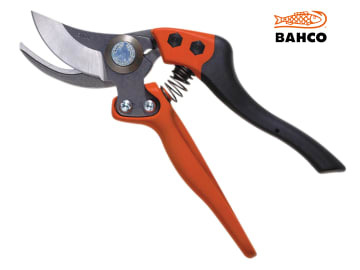 These new Bahco secateurs are ergonomically designed to fit perfectly in the hand, with comfort and a good positive grip, as the shape and size of the handles are adapted to the size of the hand. The cutting head on the Bahco PXL2 adapts to the task to be performed, and gives a good clean cut, on twigs, branches or delicate flowers that need pruning. Bahco have used the most up to date materials in constructing these secateurs for comfort, cutting performance and to help reduce fatigue and pain, as the PX handles are made of composite material with soft rubber on the upper part. These are available in three sizes, and a rotating version for all types of garden maintenance from harsh pruning of large or overgrown shrubbery, to delicate stemmed flowers, for propagating to flower arrangements: S (small), M (medium) and L (large) with three sizes of cutting heads with different cutting capacities available: class 1 (15mm, 1/2-inch), class 2 (20mm, 3/4-inch) and class 3 (30mm, 1 1/4-inch) and a main feature is all cutting heads fit all handles. Version: Class 2 PX-M2 Medium.